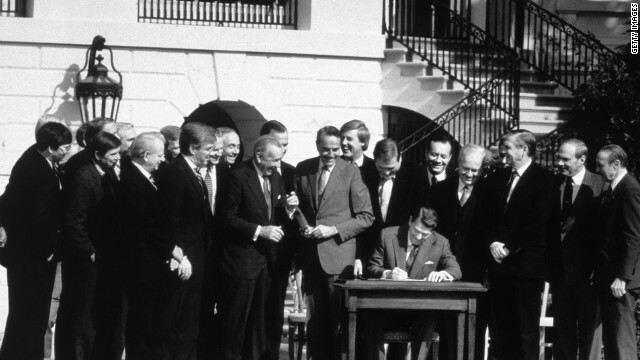 President Ronald Reagan signs the Tax Reform Act in October 1986, with congressional leaders joining in the ceremony. Editor's note: Gloria Borger is CNN's chief political analyst, appearing regularly on shows such as "AC360˚" "The Situation Room," "John King, USA" and "State of the Union." (CNN) - There are plenty of ways to game the upcoming Supreme Court decision on health care reform, and they've all been said: President Obama loses in court, he wins with his base. Or it's a severe blow, potentially fatal. Or Republicans benefit if they win, because they were "right" all along. Or the GOP loses, because it has to figure out what to offer for health care instead. But there's something else going on here, and it's more meaningful than some short-term political skirmishing. This Supreme Court case is the Waterloo for political polarization, because it underscores something we should have known all along: Great changes in national public policy should never be erected on slender partisan majorities. Our country needs a complete fixing and this band of idiots we have in office have got to be voted out,and that goes for cities,counties,states, and definitly the feds.Get out and vote people.Our country in in big trouble.We can change it as a group.Go USA.Jim Thomas Phx.Az. Medical coverage should be the right of a US citizen. I am a Vet of 44 years and I get VA service connected disability, but not all Veteran can qualify even if they have done 4 tours in war, congress has never fix it for all Vets. The insurance company do not want Obama care so they have lobby the GOP and the Tea party, knowing full well they have no intentions of helping the middle or poor class have medical coverage. Just look how they want to do away with Medicare. Just stop and think if they allow all Vets to have VA medical coverage and have the spouse join medicare in the long run this country would save money, But they like to fill their pockets with insurance company money including the supreme court GOP judges. Considering that Obama got zero votes on his last proposed budget, not a single Democrat voted for it, tells me that Obama is the real problem. Not Democrats or Republicans, it's Obama. If he were to lose the election and Mitt Romney were to win, you would see Romney reach across the aisle to work with Democrats to get things done. Obama can't even get Democrats to go along with his schemes knowing that they would have to defend them in their own re-elections back home. They don't get the main stream media support that Obama gets and they sure don't want him coming to their home towns to campaign for them. Let's talk about health care......1960, 1970, 1980, 1990, 2000, 2010....on and on. Today I am a little upset with the whole thing. Reason: Today I found out that one of my good friends passed away. Kay was 70+ and still working at Walmart in Mount Vernon, Illinois. I once asked her why she was still working. She said, "Beacuse of the health insurance". Without the insurance she could not afford her medical and medication bills. She passed this last Monday. She worked right up to the very end. Americans should not have to suffer this. I feel so sorry that Kay didn't have some retirement time, to enjoy her life and her family. Assuming that the last sentence above "Great changes in national policy should never be (enacted) on slender partisan majorities" refers to the Supreme Court, is the question then – when the Court would split 5-4 on such policy matters they should let stand Congressional action? If so, no matter how wise that might be – take Brown v Board of Education of Topeka (1954) which overturned Plessy v Ferguson (1896) with a 9-0 vote, that concept is not contemplated in our Constitution. In "Brown", the Justices were moved not by partisanship and party ideologies but what, in their opinion, was best for our country pursuant to our Constitution. Every Supreme Court should be followed by such principle. The health care law represents a major test for non-partisan impartial decision by our Supreme Court. The integrity of the Court, already stained by prior decisions is what is at stake on the health care law decision.